You need just 10 ingredients and 15 minutes of active preparation time to make this fresh Pineapple Pie from scratch. No store-bought pie crust. Ultra flaky and buttery pie crust filled with sweet, fresh, and juicy pineapple. This will be your new favorite pie. Ready for the ultimate summer pie, guys? 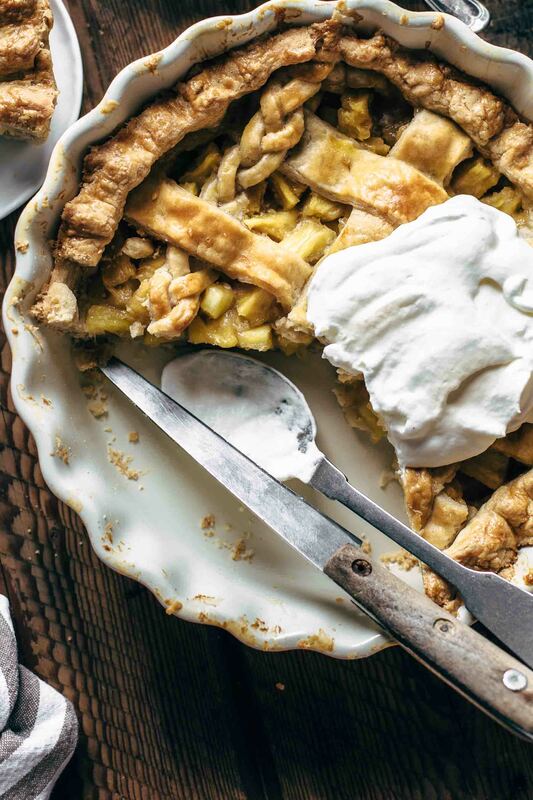 This Pineapple Pie is a taste explosion. Your taste buds will be catapulted to summer immediately. I don’t know how the weather is where you live but here in Austria, we have already summer weather. And what is better than buttery, flaky pie filled with juicy pineapples? Well, I don’t have an answer to this either. To be honest, Pineapple Pie is not the number one star among pies. Think of pie. What comes first to your mind? 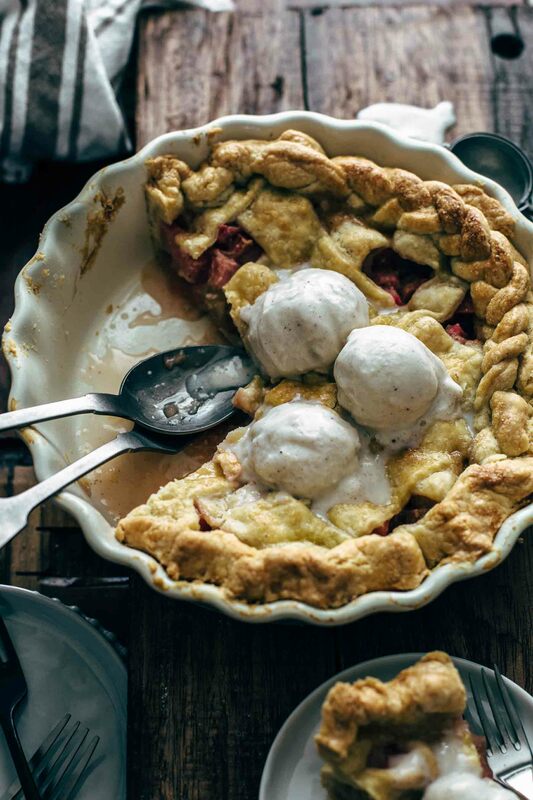 Maybe apple pie especially around fall/winter season and strawberry pie in spring/summer? Or maybe blueberry pie. However, nobody thinks first on Pineapple Pie. But why? Who doesn’t love the taste of pineapples?! So, what is so great about Pineapple Pie? The texture of the pineapple fits perfectly to the flaky pie crust. The pineapple is soft with a little bite. It is like you are eating fresh pineapple in a pie crust. Doesn’t that sound great? Cut pineapple in 1/2 inch chunks. Then add brown sugar, salt, lemon juice, and cornstarch. Simple ingredients and nothing very dominating that the pineapple is in the front. The lemon juice brings out the flavor of the pineapple. A bit of lemon is a great flavor enhancer. Did you ever try papaya with and without lemon at the same time? Huge difference. HUGE. I have to point it out again. The tropical taste of pineapple in the buttery, flaky pie crust is out of this world delicious. Ok, so you know now why you should fill your pie crust with pineapple the next time, right? 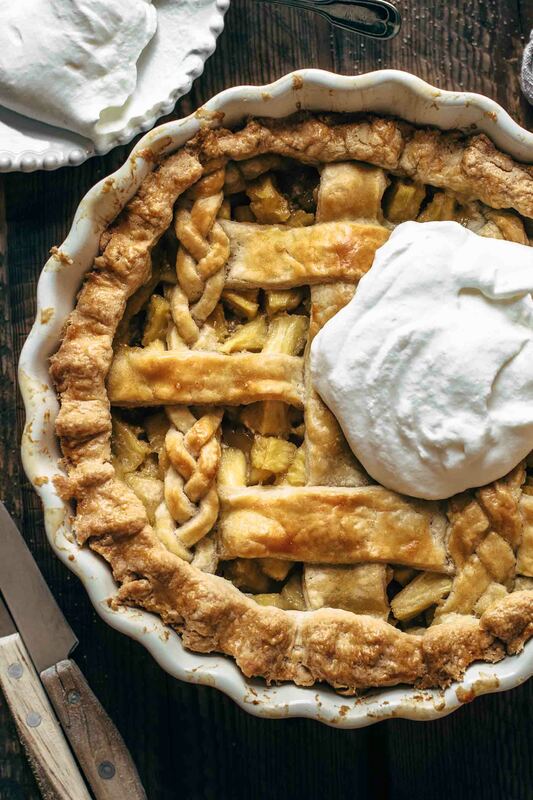 Now let’s talk about pie crust. Pie crust made from scratch to be more specific. I don’t judge anyone who uses store-bought pie crust. But hey. 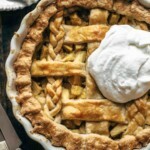 If you are on the store-bought team, just try this easy pie crust recipe once and you will change the team immediately. Butter, flour, salt, sugar, water. That’s it. These are very basic ingredients and the pie crust is pretty cheap when you make it on your own. 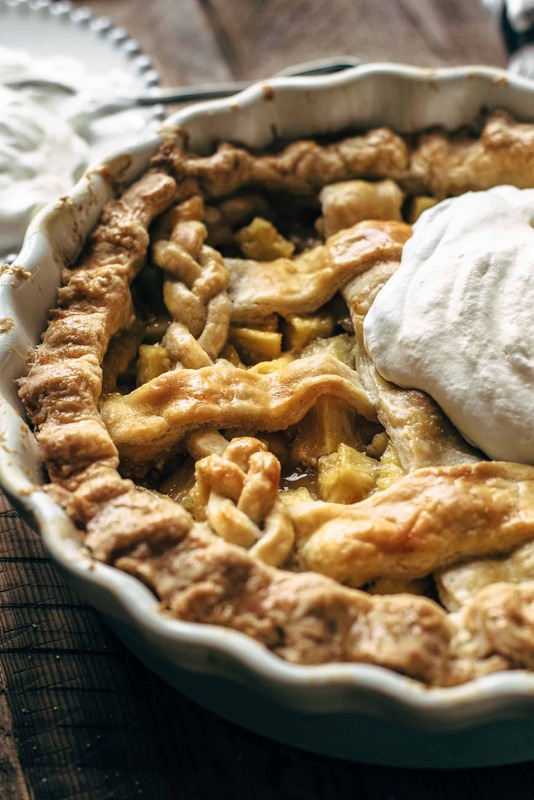 The fastest method to make pie crust is in a food processor. This literally takes less than a minute. If you don’t have a food processor then make it with a pastry cutter or alternative with two forks instead. Both methods are described in the recipe below. Add 4-6 tbsp of water to your pie crust. This is depending if it is summer or winter because of humidity and room temperature. When it is warmer I need to add 6 tbsp of water, in winter 4 tbsp of water are fine. The decoration of the pie crust is up to your preference. 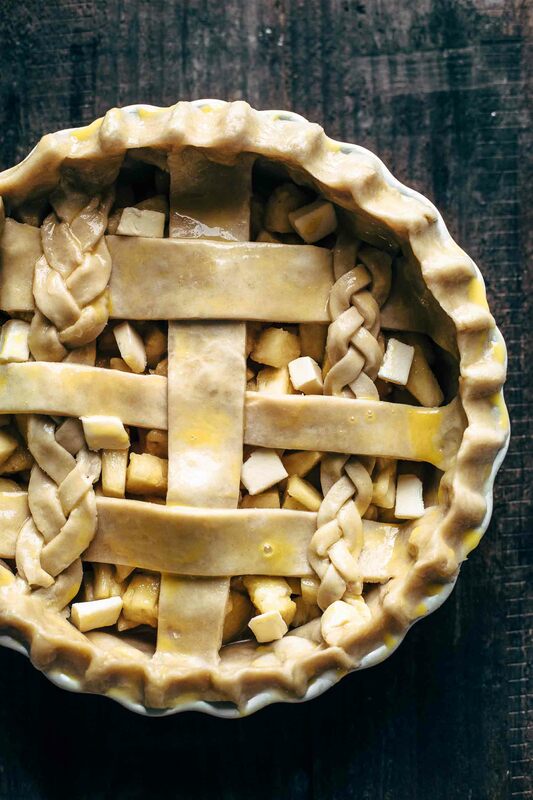 You can make a lattice, braid it, cut thinner or thicker stripes, or cover it completely and cut just a few slits in it that the steam can escape throughout baking. 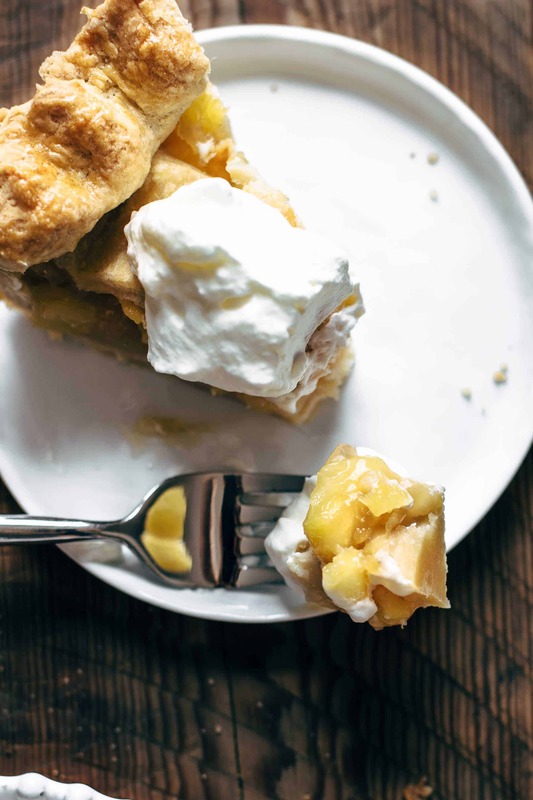 It doesn’t matter how you style your Pineapple Pie as long as you top it with ice cream and whipping cream. Ice cream and pie is made for each other, amiright? If you make this Pineapple Pie from scratch recipe, rate it and tag a photo #alsothecrumbsplease on Instagram! Would love to see your snap! 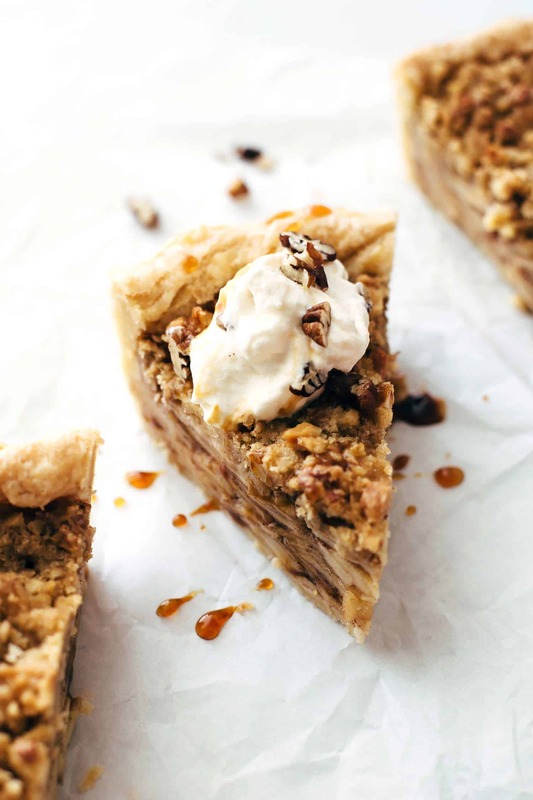 You may also like Easy Rhubarb Pie Recipe From Scratch, Super easy Apple Walnut Pie, My Favorite Strawberry Rhubarb Pie, Mini Cocoa Custard Pies, or click here to see all recipes. You need just 10 ingredients and 15 minutes active preparation time to make this fresh Pineapple Pie from scratch. No store-bought pie crust. Ultra flaky and buttery pie crust filled with sweet, fresh, and juicy pineapple. This will be your new favorite pie. Make the double pie crust with a food processor: Place cold butter, flour, salt, and sugar in a food processor and pulse 4-5 times. Pea-sized butter flakes should still be visible. Add one tablespoon water after another and pulse 1-2 times after every tablespoon. Stop adding water when the dough starts to clump and holds together when you press the crumbs together in your hand. If you don't have a food processor, then make the double pie crust with a pastry cutter or two forks instead: In this case mix together flour, salt, and sugar in a large mixing bowl. Then add butter and cut it into the mixture until it resembles coarse meal with pea-sized butter flakes. Then add water little by little until the texture starts to clump. In a large bowl stir together pineapple, sugar, salt, lemon juice and stir to combine. Add cornstarch and stir until combined. Fill into the pie crust. Then cut butter into small pieces and put on top of the filling. Roll out second dough disc and cut into 1-2 inch strips. Arrange strips in a grid on top of your filling and lay over and under one another carefully. Seal and flute the edges. Brush with egg. Bake for 45-50 minutes. Cover the first 20 minutes with parchment paper to prevent it from browning too much. Let cool to room temperature and chill for 4 hours in the fridge. Store leftovers in an airtight container in the refrigerator up to 3 days. Looks outrageous!! I’m always amazed by your photography, Pinning! With out a doubt the best recipi onpie.!!!!! Thank you so much, Robert! I’m happy that you like it! Was looking for a different way to use up a pineapple. I’m so happy I found this recipe. Made it and everyone was super skeptical but then ended up loving it! I know, Pineapple Pie is not very usual but so delicious. I’m happy that you like the recipe as much as I do!